This is kind of an introduction to Swedish Lapland. Starting out softly with kokkaffe, cinnamon buns and a tour of a wilderness exhibition – and ending up in a hole in the ice in the middle of nowhere. 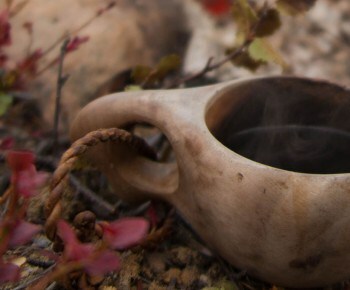 The kåsa, wooden mug, is handmade. They’re all one of a kind and Catrin takes her time to choose hers. Finally, she picks up one with inserts of reindeer bone and finicky engravery. She holds out the kåsa and Thorbjörn fills it up with kokkaffe, boiled coffee typical for the region. And hands her a cinnamon bun. – It’s freshly baked, he ensures us and throws another log on the open fire. 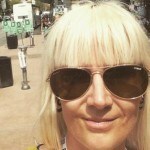 Catrin is from Germany. Southern Germany, to be precise. From Cologne. She’s part of a group with tens of Germans that have never been this far north. We’re in the forest surrounding Svansele, usually referred to as Europe’s last wilderness. 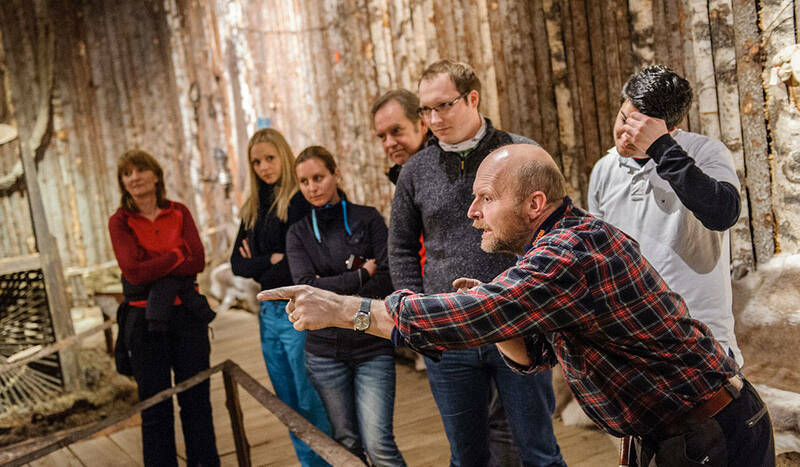 First, an introduction to the sub-arctic fauna of Swedish Lapland at the wilderness exhibition. Even though it’s in the middle of winter, the wilderness exhibit will give you an accurate sensation of the sub-arctic fauna of Swedish Lapland. All wildlife is represented and displayed according to the season: spring, summer, autumn and winter, everything from tiny Willow Warblers (Phylloscopus trochilus), to the Golden Eagle, wolverine and wolf. As always, Thorbjörn, our host, is in an excellent storytelling-mood. Imbued with great ardour he alternates anecdotes from his eventful life in the forests surrounding Svansele with facts about the wildlife and their nature.  – What are they doing there? someone in the group asks and points a finger at three bears appearing to be launching an old rowing boat. – It makes you wonder, right? replies Thorbjörn. That might be my favourite montage in the entire exhibit. It does make you wonder. Catrin nods in agreement, a bit absentmindedly with her eyes fixed on the bears. Rush-hour in the wilderness surrounding Svansele. Winter overalls, sturdy shoes, gloves and a helmet. And everyone’s own snowmobile. Catrin gives a thumbs up while trying out a comfortable position on the snowmobile seat. A big smile spreads across her face. This is her first time on a snowmobile. And at last, it’s time for the moose safari. Someone in the group asks about our chances of seeing moose. After all, it is a wild animal. – Conditions don’t get better than this, he says. 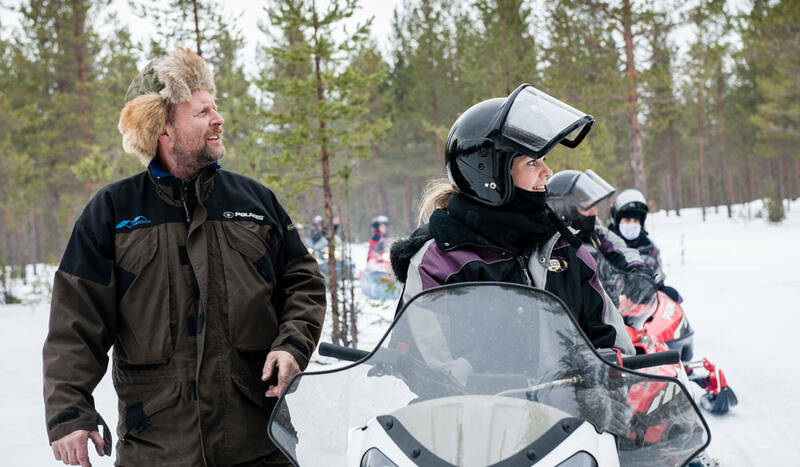 One last time Thorbjörn makes sure that everyone has their snowmobiles figured out. And off we go. As said, Catrin and her fellow travellers are not accustomed to operating snowmobiles across a snow-covered landscape as in Swedish Lapland. But they learn quickly, even though Thorbjörn has to help someone who’s skidded off track up again, on a regular basis. The safari spots moose tracks and droppings. Thorbjörn holds up his hand and every snowmobile behind him come to a halt. He’s spotted tracks. Moose tracks. Curious the group gathers around him. Thorbjörn points at the black, round bullets in the snow. – Moose droppings, he determines. 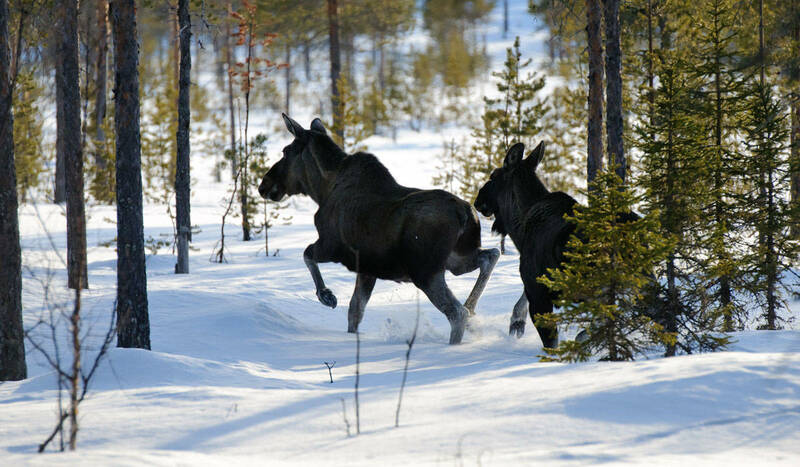 As snowflakes start falling from the sky, Thorbjörn talks about the life of the northern moose, how the mother shuns her calf when a new one arrives, and that spruce shoots are their favourite food. Someone in the group asks if it isn’t time to see the real thing. There! Is that a moose? – Yes, the tracks in the snow are promising, Thorbjörn says and starts his snowmobile. Any kind of authentic nature experience with wild animals has an amount of uncertainty, but Thorbjörn isn’t worried. Not at all, actually. You can tell a mile away. And all of a sudden, there they are. The moose. 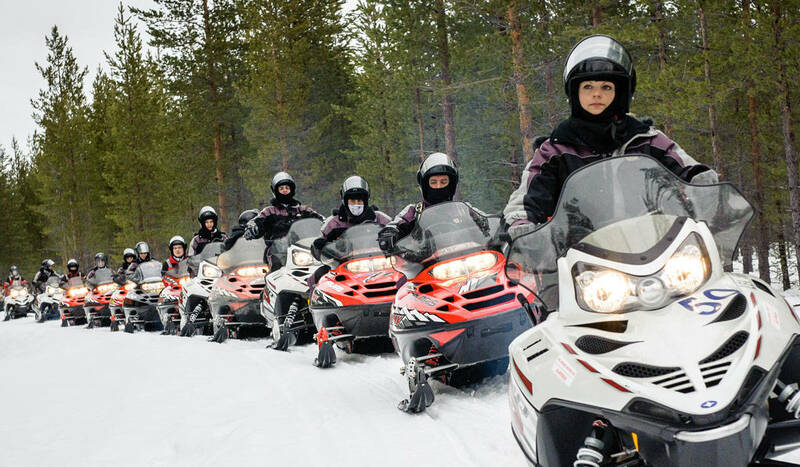 Catrin, in the forefront of the snowmobile convoy, is one of the first to notice Thorbjörns extended hand. The snowmobile sounds die out in an instant. There they are. Two of them; a female and a calf. – A moose calf weighs about 15 kg at birth, says Thorbjörn, but can weigh up to 150 kg the same fall. – Wonderful, a mother and a daughter, Catrin says quietly. The moose seem unaffected by standing in the limelight. There’s plenty of opportunity for everyone in the company to have a good look at the giant animals amongst the pine trees. 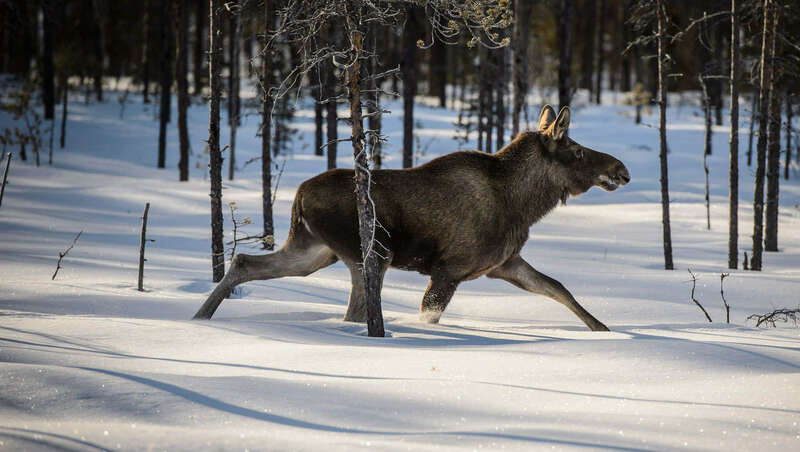 – The moose in northern Sweden tends to be a bigger than the one in the south, Thorbjörn continues, a really big male can weigh well over 500 kg. At the wilderness camp, there’s no electricity, no running water or other amenities. There are torches flickering everywhere. It’s already getting very dark although it’s not even four o’clock in the afternoon. The camp is in the middle of nowhere. 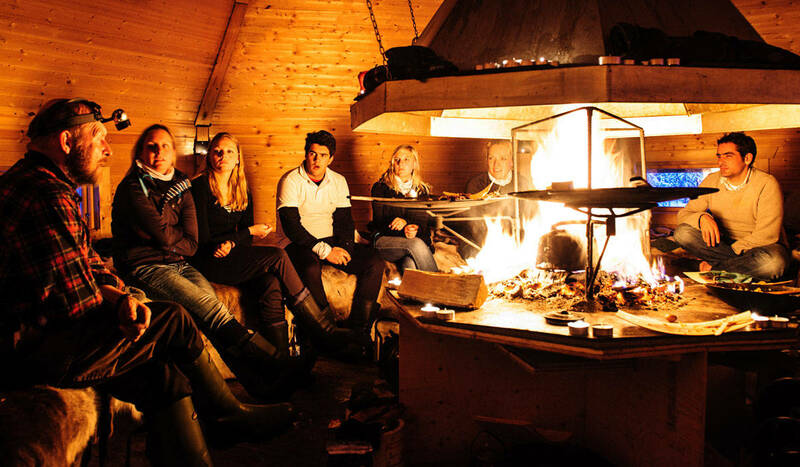 It consists of robust, timbered tepees, a few cabins, a hot sauna and steaming outdoor hot tubs. In the biggest tepee, Thorbjörn is using three muurikkas, similar to a large wok, to cook over the open fire. One with fish, meat on the other, vegetables and potatoes on the third. – Just salt, he says and puts back the salt cellar. No other spices. They’re not needed. The meat and the fish are already naturally flavoured. There's nothing like a meal prepared over an open fire after a day outdoors. There’s a muffled atmosphere in the tepee. Busy, but tone-down conversations with the fire crackling in the background. Catrin sits in silence. Her eyes fixed on the fire. Soon she will return home, to the bustling Cologne city-life. To the thousands of people daily surrounding her, without her even noticing. There are no unfamiliar people in the Svansele forests. Everything is different here. Not necessarily better. But definitely different. 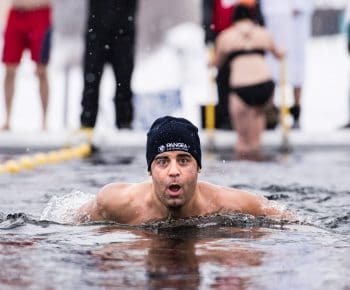 ...except maybe a hot bath after taking a dip in a frozen river. 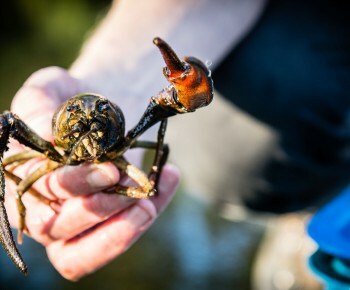 Svansele Wilderness Center offers tailor-made wilderness activities to your preferences with a focus on life in the wilderness. Activities range from picking berries and mushrooms to full on snowmobile and ice racing action. Find out more by visiting svansele.se. – Let’s hit the sauna, someone says and slowly rises from their seat. The others slowly follow. – Oh, that’s right, says Thorbjörn squinting his eyes. There’s a path from the sauna down to the lake. I’ve axed a hole in the ice and put down a ladder. If anyone of you dares, that is. Catrin gives him a big challenge-accepted-smile. A couple minutes later she takes her first steps towards the cold, icy water. When you are in Swedish Lapland and been gradually introduced to it, you have no other choice than go all the way.